I have been meaning to post about this for a while now. I took the plunge and decided to use cloth diapers with Bailey. I so regret not doing it with Avery now that I know how easy they are!! These are not your grandmother's or mother's cloth diapers. This day and age they are cute, have velcro, have a waterproof outside so you don't have to use "plastic pants" and they are really a breeze to clean! I really do love using them. It saves money and is great for the planet! At least I am not contributing much to the millions of disposable diapers that go into dump sites every day. I do put her in a disposable when we go to church and usually if we're going to be out for very long just so I won't have to deal with the cloth diaper while we're out. Not really a biggie if it's wet, but if it's dirty, I just wouldn't want to mess with it if I wasn't at home. The only thing I do differently is I use Kushies disposable liners inside the diaper. It's just a thin liner you lay on top of the diaper and it goes against their skin. It helps minimize poop clean up when they have a dirty diaper. You just flick the liner into the toilet and flush! Less clean up for you. Also, I only use BumGenius one size diapers. They are awesome and are supposed to fit from newborn until they are potty trained! They have a snap system that lets you adjust them. I think I have only had 2 leaks with these diapers and that's because I left it on too long. I mean through the night (12 hours) plus a couple more because she slept late. Give them a try! 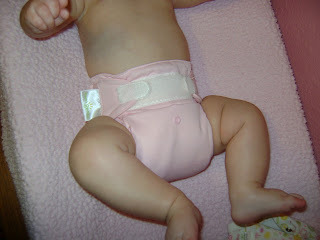 So glad to hear you have jumped on the cloth diaper band wagon! We got all Bum Genius ones when Grant was a newborn and have never looked back! While they are an investment in the beginning, they are so much cheaper in the long run, Grant has never had a rash-ever, and they are so much nicer, cleaner, and cuter to me! Now with baby #2 on the way, it is going to save us even more because we already have everything! I have never bought a disposable diaper before, so I don't even know what they are like on my kid.....now I have changed tons while babysitting! Man, I would want my heiny in a soft cloth diaper if I could choose! !